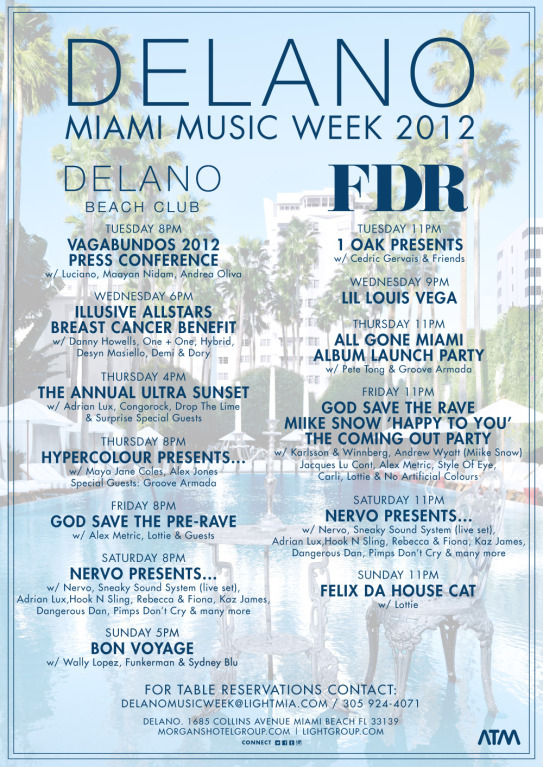 As Miami dominates the music industry this week, check out the line-up for the Delano Hotel and the FDR Lounge. Kicking off last night with the Vagabundos team and then Cedric Gervais, today sees performances from DJs such as Danny Howells, Desyn Masiello and Lil Louie Vega. With guests right through until Sunday, including Maya Jane Coles, Sneaky Sound System, Jacques Lu Cont, Pete Tong & Groove Armada, it gives you an insight into why they say Miami is three months of Ibiza crammed into one week. Click ‘read more’ for full line-up. Haze Las Vegas presents LLUSIVE All Stars Breast Cancer Benefit with DJ’s Danny Howells, One+One, Hybrid, Desyn Masiello, Demi & Dory. The Light Group will donate a portion of the bar proceeds to Susan G Komen. God Save The Rave: Miike Snow’s “Happy To You” The Coming Out Party with special guests Karlsson & Winnberg, Andrew Wyatt (Miike Snow), Jacques Lu Cont, Alex Metric, Style of Eye Carli and lottie. 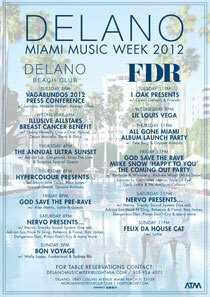 FDR Lounge says farewell to Miami Music Week with Felix da Housecat and Lottie.